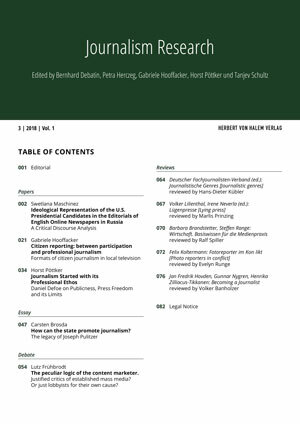 Abstract: This study examines the ideological representation of the U.S. Presidential candidates Hillary Clinton and Donald Trump in the editorial sections of the three English-language online newspapers in Russia: Sputnik International, Russia Beyond the Headlines and The Moscow Times. Through Jäger’s framework, van Leeuwen’s model of the social actors’ representation, and van Dijk’s notion of ideological square as powerful tools of enquiry within Critical Discourse Analysis, several tactics could be identified that were applied to influence public’s opinion about the candidates. The results showed that state-owned Russian media outlets made increasingly favorable comments about Donald Trump while consistently ridiculing and offering negative coverage of Hillary Clinton. In addition, an enemy image of America was constructed in the discourse, showing it as a scapegoat for Russia’s negative actions and its negative development since the collapse of the Soviet Union. On November 8th 2016, the citizens of the United States of America voted for their 45th President. Although both candidates, Hillary Clinton and Donald Trump, generally represented the principles of the Democratic and Republican parties respectively, each candidate contributed a unique dimension to the campaign. In particular, Russia’s involvement in the 58th quadrennial American presidential election can only be described as extraordinary. In fact, the election was overshadowed by fears that Russia was actively seeking to help Donald Trump win, as well as by the apparent mutual sympathy between Trump and the Russian president Vladimir Putin. Even today, the question of whether Russian cyber- and information-operations launched during the campaign were a deciding factor in the outcome of this election still remains to be answered. What tactics did the selected media outlets employ in order to influence the readers’ opinion about the U.S. Presidential candidates? How were the U.S. Presidential candidates ideologically portrayed in the editorial positions of the three English language online newspapers in Russia? What ideological groups are constructed in the discourse of the three selected online newspapers? What ideological position do these groups represent? Russian media, as well as people all over Russia, have expressed a high interest in the U.S. Presidential election. The reason for the constant monitoring of the election can be explained by the fact that the next President could dramatically influence the relationship between Russia and the United States. Consequently, many people in Russia (including those not so interested in politics) were reading and watching the news, discussing the campaign goals of the candidates, and making assumptions and forecasts. As Malenova (2016: 68) states, in the Russian media the election was often portrayed as a circus, where each candidate was a magician who always pulled a new rabbit out of his or her hat. Moreover, according to her, the coverage of the two Presidential candidates in general as well as their metaphorical portrayals were extremely contradictory in the Russian media. As Kluver (2016) points out, the Russian media depicted Donald Trump during the campaign as a “reasonable” candidate and mainly focused on Trump’s “business acumen, his strong leadership skills, and his willingness to pull away from NATO” (p. 67). In contrast to Donald Trump, Hillary Clinton was tied to numerous conflicts over Russian engagement in Syria and the Ukraine. Opinion columns, also called “editorials,” are texts aiming at presenting the views of the newspaper’s editorial board on an issue. In other words, editorials are comments and evaluations on news events of national concern that have already been reported in the newspaper. Such news items may be “political, economic, educational, religious or general socio-cultural issues that border on the welfare of the people” (Ashipu, 2013: 48). Generally, editorial pages can be considered as a kind of “media discourse,” that belongs to the large class of opinion discourses (van Dijk, 1995; Farrokhi and Nazemi, 2015: 157). Fowler (1991) and Reah (2002) state that the main aim of an editorial is not only to arouse interest and curiosity in readers but also to influence the reader’s views and speak for the news organization’s point of view through analysis and comments on the news. Bhatia (1993, p. 170) and Ogunsiji (2001) argue that an editorial offers the views and opinions of the newspaper, and is normally regarded as the newspaper’s analysis, discussion, opinion or verdict on the issues of the day. Moreover, due to their ideological role editorials are expected to be linguistically complex. According to van Dijk (1998a: 23), the concept of ideology is “one of the most elusive notions in the social sciences.” Although the concept of ideology is vague, it is often used in the media and in the social sciences. Moreover, it has been defined in many ways by various schools of thought and by a vast number of different scholars working on ideology, power relations, hegemonic trends as well as discourse studies. Despite this variety, van Dijk’s (1988) definition is particularly well suited for the purpose of this study, as it allows analyzing ideology through a critical discourse analysis approach. According to van Dijk (2006b), the definition of ideology is complex and multidisciplinary. For this reason, he proposes several theses in order to clarify his notion of ideology. The first one is that ideologies are primarily some kind of “ideas,” i.e. belief systems. The second assumption implies that there are no private, personal ideologies because ideologies as belief systems are socially shared by the members of a collectivity of social actors. The third thesis assumes that, compared other socially shared beliefs, such as sociocultural knowledge or social attitudes, ideologies are rather “fundamental” or “axiomatic” (van Dijk, 2006b). Consequently, they control and organize other socially shared beliefs of a fairly general and abstract nature. Finally, van Dijk (2006b) argues that ideologies are gradually acquired and sometimes change over a time period and thus, consequently need to be relatively stable. In order to acquire or change ideologies, usually many discourses and experiences are necessary. In other words, CDA is an approach that is generally interested in analyzing “social phenomena which are necessarily complex and thus require a multi-methodical approach” (Wodak and Meyer, 2009: 2). The central principle of CDA, however, is its critical approach. The approach analyzes specifically the use of issues of power, hegemony and resistance in various fields of language. Consequently, it also pursues the aim of CDA to reveal hidden relationships and causes between discourse and society that are not obvious to the people involved in the discourse (Fairclough, 1992: 9). Thus, in this context, “critical” implies showing hidden connections, relations and causes. Critical discourse studies can involve many dimensions. One important dimension focuses on ideologies framed and propagated in various discourses in social contexts. As Fairclough (1989) states, one of the main objectives of CDA is to deconstruct ideological assumptions that are hidden in written texts or oral speech in order to resist and overcome various forms of power. Deciphering ideologies is essential because “ideologies are typically, though not exclusively, expressed and reproduced in discourse and communication, including non-verbal semiotic messages, such as pictures, photographs and movies” (van Dijk, 1995: 17). In other words, CDA mainly focuses on how social relations, identity, knowledge, and power are constructed through written and spoken texts in communities, schools, the media, and the political arena (Luke, 2005). In this study, Critical Discourse Analysis (CDA) is the main analytical approach. The study employed three frameworks as powerful tools of enquiry within Critical Discourse Analysis, proposed by three different CDA scholars, in order to analyze various aspects specified in the research questions. The analysis addressed the first research question mainly with the CDA approach of Siegfried Jäger (2015), who was the first to publish a German-language book about the methodology of CDA using Michal Foucault’s discourse theory. According to Jäger, the first step in a CDA is the conception and planning phase. Here, the researcher must choose and explain his or her general subject and discourse plane. The second phase is the material identification phase. The concrete corpus for analysis must be identified, delineated, and all specifications must be justified. In the subsequent collection phase, a general characterization of date sources must be provided. The next step is the actual analysis of the corpus. This is divided into two parts: the structural analysis and the detailed analysis. A structural analysis should roughly capture the characteristics of articles on particular aspects of interest, such as illustrations, layout, the use of collective symbols, the vocabulary, and so on, and identify which forms are typical for the newspaper (Jäger, 2015: 95-97). The next step is a detailed analysis of typical discourse fragments (Jäger, 2015: 98-108). For this purpose, discourse fragments that are typical for the particular newspaper are selected on the basis of the structural analysis. A detailed analysis should cover the following aspects of the typical discourse fragments: the context, surface of the text, rhetorical means, content and ideological statements, as well as the discourse position and the overall message of the article. At the end of the detailed analysis, the interpretations of single aspects are combined into a total interpretation of the article. Finally, the last step proposed by Jäger (2015: 108-111) is the synoptic analysis. Here, a final assessment of the newspaper’s discourse position is made. The findings from the structural analysis and the detailed analysis are interpreted in relation and in comparison to each other. The second research question focuses on the depiction of the two U.S. Presidential candidates, which is why van Leeuwen’s (2008) framework analyses the representation of social actors is an important part of this study. In his book on the representation of social actors, van Leeuwen (2008: 32) introduces “a sociosemantic inventory of the ways in which social actors can be represented.” His model allows the critical enquirer to “bring to light […] systematic omissions and distortions in representations” (van Leeuwen, 1993: 194). To this end, several morpho-syntactic categories of his inventory were used in this study to look at the ways Hillary Clinton and Donald Trump were represented as actors in the editorials. The selected categories analyzed in this study were: inclusion and exclusion, suppression and backgrounding, activation and passivation, subjection and beneficialisation, individualization and assimilation, determination and indetermination, and finally nomination and categorization. In order to answer the third research question, the researcher identified, scrutinized, and compared the ideology carrying categories proposed by van Dijk (1995; 2006a). His notion of the so-called “ideological square” helped to identify ideological groups in the discourse and to understand the reasons for their existence. The concept of the ideological square mainly focuses on the strategies of a positive “in-group” description and a negative “out-group” description (van Dijk, 1998a). The double strategy of this binary opposition comprises van Dijk’s semantic macro strategies, which provide the features for positive self- presentation and negative other-presentation. As van Dijk (1998a) observes, the ideological square acts as a kind of justification for the presence of inequality in the society by polarizing “in-groups” and “out-groups” through the process of emphasizing “Our” good properties/actions and “Their” bad ones as well as mitigating “Our” negative properties/actions and “Their” positive ones (van Dijk, 1998a: 35). There are numerous discursive structures and strategies that aim at helping to acquire, express, enact and reproduce ideologies in a discourse (van Dijk, 2004). Van Dijk (1998a: 45; 1995) defined several ideology-carrying categories that were applied in this study: surface structure, syntax, lexicon, local semantics, global semantics, and rhetoric. Furthermore, in his paper “Politics, Ideology, and Discourse” (2006a), van Dijk elaborates on 27 ideological strategies, among which the fundamental dichotomy of “self positive-representation” and “other negative-representation” stand out. The selected key terms of the framework are the following: Actor Description; Categorization; Disclaimer; Evidentially; Hyperbole; Implication; Irony; Lexicalization; National Self Glorification; Number Game; Polarization; Presupposition; and Vagueness (van Dijk, 2006a, p. 735). This study focused on examining editorials published in the last four months before the 58th quadrennial American presidential election (July to November 8th 2016). As for the choice of the media outlet, there are a number of English online newspapers in Russia that mainly target an international English-speaking audience, internationally-oriented residents of Russia, and Russian citizens abroad. 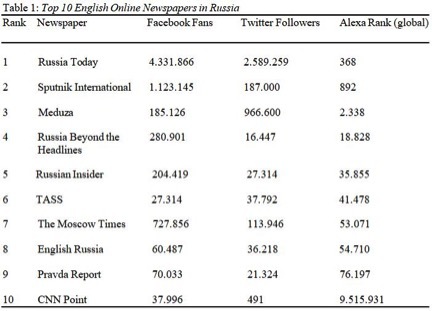 Table 1 presents the top 10 English-speaking online newspapers in Russia sorted by their global Alexa traffic rank, Facebook fans, and their Twitter followers. There were a number of criteria for the selection of the news portals for this analysis such as language, orientation of the media outlets, presence of an editorial section and/or an opinion column, and size of the outlets. A relevant selection criterion was that the media outlet needed to be popular and well-known among social media and internet users in general. Although RT is the most widespread Russian broadcaster that is also watched and read internationally (Alexa global ranking 340), this media outlet was excluded from this research. The reason for this decision was RT’s focus on an op-eds by guest writers, so that the opinion of the RT editors remained unclear. After reviewing the most important and popular English online newspapers in Russia and taking all the selection criteria into consideration, 27 editorial pieces in three media outlets were chosen for the final analysis: Sputnik International (16 articles), Russia Beyond the Headlines (6 articles) and The Moscow Times (5 articles). The first two media outlets are most likely to represent the “official” governmental view. The Moscow Times’ angle of reporting was considered worthy of investigation as an alternative, non-governmental Russian opinion on events. For the detailed analysis two articles per newspaper were selected due to the fact that in sum they represented the main discourse strands of the particular paper and exhibited the media outlet’s typical features, such as visual signs, rhetoric, etc. Structural analysis of Sputnik International’s discourse showed that Russia and its attitude toward elections as well as the Russian-U.S. relations in general were the focal points of its discourse. The main discourse strands were Clinton’s anti-Russian election campaign, the candidates’ connections to Russia, and Russian opinion on which candidate would contribute more to an improvement in Russian-U.S. relations. The detailed analysis of two Sputnik International’s editorials revealed that although both candidates had diametrically opposed views on Russia, neither of the candidates gave Russians real hope of a relief in tensions with Washington. Consequently, since there was no prospect for improvement, it would be important to maintain the status-quo. In other words: predictability in foreign policy is always better than unpredictability, which unsubtly means that “predictable foe” Clinton was better than “unpredictable friend” Trump. The synoptic analysis revealed several tactics applied by Sputnik International in order to influence the public opinion could be identified. The first and most obvious tactic is Sputnik’s application of visual signs, especially the eyecatchers and/or pull quotes. These are usually short pieces of text set in larger type than the rest of the page and intended to attract attention. They were especially used in order to highlight experts’ positive opinions on Trump or experts’ negative opinions on Clinton. The second tactic applied by Sputnik International was spreading of misinformation, withholding of some important facts on particular issues, or implying information without providing any evidence. For example, the media outlet stated that neither RT nor Sputnik were state-run media outlets, although there was evidence that they were both operated by companies funded by the Russian government (Intelligence Community Assessment, 2017). The third tactic was the victimization of Trump and Russia. Sputnik International consistently cast Trump as the target of Clinton’s accusations and unfair coverage from traditional US media outlets that, according to Sputnik, were subservient to a corrupt political establishment. This tactic was intensified through an assimilation of Hillary Clinton and other Trump’s opponents into groups while individualizing Donald Trump within the discourse: Clinton and her supporters (“Clinton camp,” “Hillary’s team,” “Clinton’s campaigners,” “Clinton supporters”) and also Trump’s undesirable supporters (“radical hate groups,” “white supremacists,” and “racist hate groups”) were juxtaposed in opposition to the individual Donald Trump. This created an impression of unfairness and contributed to the intention of the outlet to depict Trump as a victim. Moreover, additional victimization of Russia through Clinton’s accusations regarding the WikiLeaks email dump and sanctions over Ukraine portrayed Russia as Trump’s partner in crime. Paradoxically, Sputnik denied any direct connections between Trump and Russia.. Finally, the word choice as well as the rhetoric of the discourse in terms of Clinton’s anti-Russia campaign revealed several interesting techniques for influencing public opinion. Expressions such as “anti-Russian hysteria,” “using the Russian card,” “conspiracy theory,” and “Cold War” were very prominent within Sputnik’s discourse. For example, the metaphor “Russian card” stood for Russia’s involvement in the American election and was often used in combination with Clinton’s accusations of Russia being responsible for the WikiLeaks file dump. However, the editorial pieces either denied such accusations referring to the fact that there was no evidence or just constructed an axiom of Russia’s innocence. This was achieved by the use of tactics such as anonymous indeterminations, exaggerations, ironical remarks, and generalizations in order to cause ambiguity and thus an ability to not give rise to precise truth conditions. The structural analysis of the RBTH’s discourse identified two main topics addressed by the media outlet: Russia’s view on the American elections and the electoral campaigns of the Presidential candidates. The three main discourse strands were the anti-Russian campaign of Clinton, Trump’s popularity in Russia, and Russia’s favorite candidate. The detailed analysis of the two selected articles identified and explained several reasons for Trump’s popularity in Russia. Moreover, the editorial pieces favored Trump’s presidency over Clinton’s presidency because of Clinton’s negative history with Putin from her time as Secretary of State, which would make it difficult to improve the Russia-U.S. relationship. The synoptic analysis of the RBTH’s discourse strategies revealed several tactics that editors applied in order to influence the opinion of its readership. An important tactic was the application of visuals in the RBTH discourse. For instance, cartoons were used for editorial pieces that focused on the anti-Russian campaign of Clinton and her accusations against Trump for his apparent connections to Russia. Within the discourse, these two aspects were either rhetorically ridiculed or ironically refuted, which was intensified through the use of cartoons as headers of the editorial pieces. Another tactic was the partial assimilation of Hillary Clinton to the “U.S. Democratic Party,” “American Democrats,” and “Democrats,” especially when talking about Russia’s role in the American election and Clinton’s accusations against Russia. In line with this, a partial victimization of Russia could be identified. Russia as an actor was depicted as a victim abused by Clinton and her campaigners in order to attack Trump. Several rhetorical and stylistic tactics were applied in order to influence the readers’ opinion about the candidates. The most prominent tactic was the use of ideologically loaded words, metaphors, and ironic remarks. For example, the terms “Russian card,” “demonization of Russia,” “devil,” “diabolic cunning,” and “Cold War” were only used in connection with Clinton. Another important tactic was to include only anti-Clinton quotes from the experts, use indeterminations in order to achieve vagueness, and misinforming the readers by implying statements without supporting the argumentation with proven facts. The structural analysis of MT’s discourse identified only one main discourse topic, which was Russia’s politics. Here, three discourse strands deserved closer attention: Trump’s connections to Russia, the alt-right movement, and Russian-U.S. relations. The detailed analysis showed that with the “Trump phenomenon,” it is now time for big changes for the West. Moreover, these changes have already happened in Russia but they have always been criticized by the Western society. The overall picture of Russia and the West that was established in The Moscow Times’s discourse was predominantly negative. Russia was depicted as being the same as the West, although Western society refuses to acknowledge it. This is the reason why Russia subtly mocks and indirectly sabotages America, as long as it does not admit the similarities. Within the editorial pieces of Sputnik International, Hillary Clinton was slightly more included into the discourse than Donald Trump (51 vs. 49 percent). However, she was also more excluded (65 vs. 35 percent) and more backgrounded (80 vs. 20 percent) than Trump. The editors of Sputnik strongly referred to Trump in terms of his occupation and emphasized his role of the Republican nominee, a successful businessman, and a “bombastic” millionaire. Yet, the researcher found that the editorial pieces of Sputnik International mainly focused on Hillary Clinton, her email scandal, as well as on her accusations of Trump and Russia. Clinton was activated as an individual within the discourse, mainly in terms of her accusations against Trump (52 percent). She objectified and labeled Trump as a “Russian agent,” a “Kremlin tool,” an “unwitting agent” of Vladimir Putin, and a “Moscow’s man.” As a reaction to these accusations, Trump was first passivated (53 percent), but later activated (48 percent) when he defended himself or denied the allegations. Moreover, the prominent individualization of Trump (71 percent), as well as an enhanced assimilation of Clinton (96 percent) into the “Clinton Camp” or “Clinton Team” intensified the effect of victimization of the Republican candidate within the discourse. Contrary to this, the editorial pieces of Russia Beyond the Headlines focused mostly on Donald Trump as social actor (62 percent). Additionally, Clinton was more excluded (90 percent vs. 10 percent) and backgrounded (90 percent vs. 10 percent) than Trump. Trump was also almost twice as much nominated (67 percent vs. 33 percent), formalized (77 percent vs. 23 percent), categorized (67 percent vs. 33 percent), and appraised (83 percent vs. 17 percent) as Clinton. The authors labelled him as “an eccentric billionaire,” the “Republican enfant terrible,” the “flamboyant Republican presidential candidate,” a “witty provocateur,” and in contrast, referred to Clinton as a “meticulous intellectual.” In addition, Trump was also more activated than Clinton (76 percent vs. 24 percent). In terms of the category individualization and assimilation, Clinton was most likely assimilated to the “U.S. Democratic Party” or “Democrats” (91 percent) while Trump was mostly depicted as an individual (71 percent). The focus of The Moscow Times was clearly on the Russian-U.S. relations, which is why the two candidates were not always in the focus of attention. However, both candidates were treated similarly within the discourse, although Clinton was more activated (68 percent), which could be explained with her active role in the accusations of Trump. Within the editorial pieces of The Moscow Times, Donald Trump was slightly more included into the discourse of the online newspaper than Hillary Clinton (54 to 46 percent). The authors categorized (58 percent vs. 42 percent), and especially functionalized (67 percent vs. 33 percent) Trump more than Clinton. She was referred to as “a candidate of the establishment,” and “Democratic nominee” whereas Trump was described as the “Republican Presidential candidate,” “doubtlessly talented Donald Trump,” and “The Donald.” In comparison to Trump, Clinton was more activated (64 percent vs. 36 percent) and much less passivated (32 percent vs. 68 percent). Trump was more often treated as a subject in comparison to Clinton (67 percent vs. 33 percent) and slightly more individualized. As for the discourse of Russia Beyond the Headlines, also three main ideological groups were identified: the U.S. Democratic party, the Clinton camp, and Russia. The ideological square was established between the U.S. Democratic Party/American Democrats/Democrats as “Them” and Russia/Kremlin as “Us.” In addition, the Clinton camp was represented as the opponent of Russia (“Them”), separately from the overall foe – the U.S. Democratic Party. Contrary to this, five ideological groups could be identified within the discourse of The Moscow Times: Russia, the West, the United States, the U.S. political establishment, and the Trump supporters. The most prominent ideological square was established between Russia/Moscow/Kremlin (“Us”) and the West (“Them”) as well as between America/Americans/the White House (“Them”) and Russia/Moscow/Kremlin/Russian political elite (“Us”). As can be seen, the analysis of the ideological squares showed different enemy images and out-groups among the analyzed media outlets. While Sputnik explicitly focused on the Clinton camp and the U.S. government in general as the enemy image, the RBTH differentiated between the Democratic Party as a whole and the Clinton camp as a part of the Democratic Party. Within the discourse strand of the Russian-U.S. relations, the editors depicted the Democrats as the out-group, whereas their focus in the discourse strand of the WikiLeaks email dump was on the Clinton camp as a part of the Democratic Party. The depiction of the out-groups in MT, however, was more global than in the previous two media outlets. The main out-groups were the West, USA, the U.S. political establishment (which is basically the Democratic Party), and the Trump supporters, while the focus was mostly on the West and the USA. The U.S. political establishment was the rival of the Trump supporters or the “anti-establishment constituency” and of the Russian government. Several tactics were used in order to emphasize the own positive and the opponents’ negative sides, as well as to de-emphasize the own negative and the opponent’s positive sides. On the discourse level “general,” proposed by van Dijk, positive self-representation of Russia and negative others-representation of the Democrats could be especially observed within the discourse of Sputnik and RBTH. In the case of MT, Russia as “Us,” as well as the West and the Americans as “Them,” were represented neutrally or negatively. Interestingly, the West and America were largely held responsible for Russia’s recent questionable actions, such as the annexation of Crimea, as well as the country’s negative development over the past years. However, although Russia is “an unpredictable and recalcitrant” player, it is the United States that should change its course (Lipmann, 2016). Yet, the American establishment is seen as unwilling to contemplate compromise and is instead anxious to punish Russia rather than negotiate solutions. As for the discourse level of “form,” several tactics to establish an ideological square could be identified. First, Sputnik International in particular used surface structures in order to create a positive Russia image. Through callouts and pull quotes, the editors highlighted positive experts’ quotes about Russia and its achievements. In terms of the syntax of the discourse, Russia as an actor was always activated when it had to deny any accusations or defend itself from allegedly unfair accusations in general. This tactic ensured a direct focus on the actor, although the editors did not provide any evidence and did not support their arguments with objective facts. However, Russia as a social actor has also been passivated in order to focus the readers’ attention on the actor as affected by negative action of others: “Russia has been routinely dragged into election debates” (Sputnik4). On the discourse level of rhetorical means, all analyzed media outlets used alliterations in order to draw readers’ attention to particular sections of the text, and to create rhythm and mood. The most prominent alliteration that should support the out-group building were the Clinton camp and Clinton campaigners. In addition, several semantic figures and operations such as metaphors, irony, hyperboles, and repetitions were used in order to draw readers’ attention on the social actors. Especially RBTH applied the tactic of irony to depict the in-group/out-group relations. The editors mostly used ironical remarks to ridicule America in general or explicitly the Clinton camp: “As if America does not have more important problems” (Bovt, 2016), “the willy plot that even the Soviet KGB couldn’t dream of” (Lukyanov, 2016). Finally, especially Sputnik International used the technique of repetition within its discourse to emphasize Russia’s and the Russian media innocence in America’s accusations. In terms of van Dijk’s discourse level of meaning, several strategies are important to note. In the discourse structure of the lexicon, particular lexical choices as exaggeratedly negative addressing of Russia from the Clinton camp as well as the usage of the minus words and phrases could be identified. For example, the Clinton camp addressed Russia as “Big bad russkies” (Sputnik5), the “dark side” (Sputnik6), a “feared puppet master behind Trump” and “alleged perpetrator of the DNC computer network hack” (Trudilyubov, 2016). Moreover, it used such minus words and ideologically loaded words as “demonization of Russia,” (RBTH2), “devil,” “diabolic cunning and a willy plot” (Lukjanow, 2016), as well as “anti-Russian hysteria” (Sputnik5), “conspiracy-toned discussion” (Trudilyubow, 2016), etc. in connection to Russia. Especially in terms of the WikiLeaks conflict, the authors used the tactic of implicitness/presuppositions and evidentiality in order to de-emphasize Russia’s negative actions or to deny them. For example, in Sputnik7 and Sputnik8, the authors of the editorial pieces implied that Russia had nothing to do with the email leak without providing any evidence or explanation on this issue. However, the most important tactic was the victimization of Russia in connection with generalizations and specifications, especially within the discourses of Sputnik and RBTH. The media outlets extensively described all the things the Democrats accused Russia of and made only general declarations about Russia’s actual role in the conflict in order to avoid explicit statements. Moreover, the authors of the editorial pieces very detailed depicted the situation with the primaries before the WikiLeaks scandal and thus emphasized the assumption that the leak was used by the Democrats in order to blame the country’s intelligence services for the document leak. A number of indeterminations could be identified in terms of the WikiLeaks scandal that were used in order to de-emphasize Russia’s role in it and to distract the reader from this sensitive topic: “the voices have instantly emerged claiming that the leak was organized by the Russians” (S6). Consequently, the negative actions of the Clinton camp were highlighted through specifications, while the negative role of Russia was played down by generalizations. This study examined the ideological representation of U.S. Presidential candidates Hillary Clinton and Donald Trump in the editorial sections of the three English-language online newspapers in Russia: Sputnik International, Russia Beyond the Headlines and The Moscow Times. After the CDA analysis on the basis of Jäger (2015), van Leeuwen (2008), and van Dijk (1995; 2006a), extensive answers to research questions could be found. In order to answer the first research question of what tactics the selected media outlets applied in order to influence the readers’ opinion, on the basis of Jäger’s CDA framework (2015), this study has identified several strategies that were frequently used by the media outlets as effective devices in persuasion and justification. The most prominent tactics were the application of the visual signs, ideologically loaded word choice and lexicalization, rhetorical figures, hyperboles, implicitness, evidentiality, spreading of misinformation, victimization, polarizations, disclaimers, and comparisons. Although all analyzed media outlets used visual signs in order to influence their readership, the main difference between them was the way of their application within the discourse. While Sputnik International mainly focused on the anti-Clinton and pro-Trump callouts and pull quotes from the experts, Russia Beyond the Headlines and The Moscow Times used photomontages and caricatures that supported ideological messages in the editorial pieces. These messages were also supported by the editors’ ideologically loaded word choice as well as rhetorical figures, such as metaphors, irony and hyperbole. Especially in the discourse of Sputnik and RBTH ideologically loaded words and phrases, such as the Cold War, the Russian agent, and the Kremlin stooge, were used by editors in connection to Trump and Russia. All three media outlets extensively employed metaphors, such as the “Russian trap” and the “Russia card.” In addition, spreading of misinformation, the withholding of important facts on particular issues, implying information without providing any evidence, and using indeterminations in order to achieve vagueness were especially prominent tactics within the discourse of Sputnik and RBTH. Finally, a consistent depiction of Trump and Russia as the target of Clinton’s accusations and an allegedly unfair coverage from the traditional US media outlets showed especially Sputnik’s and RBTH’s aim to victimize both actors. The second research question of how both candidates were depicted as social actors within the discourse was addressed on the basis of the framework proposed by van Leeuwen (2008). Although Clinton was slightly more included into the discourse of Sputnik than Trump, RBTH and MT included her into their discourse less often as an individual. In general, she was more excluded from the discourse and more often backgrounded than Trump. Moreover, especially in the case of Sputnik, Clinton was often referred to by her first name whereas Trump was addressed by his surname. Within the discourse, Clinton was also often activated in terms of her accusations of Trump having ties to Russia and Russia’s role in the American election and the WikiLeaks scandal. Trump, however, was mostly passivated when receiving the accusations and later activated in order to defend himself or deny the allegations. In line with this aspect, the already mentioned victimization tactic applied by Sputnik and RBTH was supported by an assimilation of Hillary Clinton into a group (i.e. the Clinton camp) and at the same time individualization of Donald Trump. The individualization of Trump depicted him as a more independent individual in comparison to Clinton and supported the impression of victimization since Trump’s opponents operated in groups while he appeared to operate alone. In contrast to Sputnik and RBTH, MT individualized and treated both candidates more similarly without victimizing Trump. These differences could be explained with different orientations, corporate lines, and financial structures of the media outlets. The state-funded outlets like Sputnik and RBTH mainly focused in their coverage of Clinton’s email scandals, her anti-Russian attitude, and the role of WikiLeaks in the election campaign. They showed Trump as a “controversial” candidate and emphasized his sympathy for Russia. On the other side, the focus of the independent media outlet MT was more global and its focus mostly was on the Russian-U.S. relations. The overall picture of Russia and the West established in the MT’s discourse was predominantly negative, as Russia was depicted as being the same as the West, although the West refuses to acknowledge this similarity. This is the reason why Russia subtly mocks and indirectly sabotages America until it admits the similarities. Finally, the last two research questions – what ideological groups were constructed in the discourse and which ideological positions they represented – were addressed. The analysis allowed to identify the different in- and out-groups constructed in the media’s discourse. While Sputnik explicitly focused on the Clinton camp and the U.S. government in general as their enemy image, the RBTH differentiated between the Democratic Party as a whole and the Clinton camp as a specific part of the Democratic Party. Within the discourse strand of the Russian-U.S. relations, the editors depicted the Democrats as the out-group, whereas within the discourse strand of the WikiLeaks email dump their focus was on the Clinton camp as a particular part of the Democratic Party. The depiction of the out-groups in MT, however, was more global than in the other two media outlets. The main out-groups were the West, the USA, the U.S. political establishment (which was basically equated with the Democratic Party), and the Trump supporters, although the focus mostly lay on the West and the USA. Furthermore, the researcher applied the concept of the ideological square to the analysis of the discourse. Prominent positive self-representations of Russia and negative others-representations of the Democrats could be observed within the discourse of Sputnik and RBTH. Especially RBTH focused on rhetorical figures such as metaphors, hyperboles, repetitions, and irony in order to emphasize and/or ridicule America’s or the Democrats’ negative actions. In case of MT, Russia was depicted more positively as in-group, while the West and the Americans as out-group were represented either neutrally or negatively. Moreover, the West and America were widely made responsible for Russia’s recent questionable actions and its negative development over the past years. Especially Sputnik used surface structures in order to create a positive image of Russia through callouts and pro-Russian pull quotes from experts. On the level of syntax, Russia as an actor was always activated when it had to deny any accusations and passivated in order to focus the readers’ attention on the actor affected by the actions of others, such as being dragged into American election debates. With regard to the WikiLeaks conflict, authors used the tactic of implicitness/presuppositions and evidentiality in order to de-emphasize Russia’s negative actions, that is, its actual and provable role in this issue. Moreover, the tactic of victimization was widely used especially by RBTH and Sputnik, mostly through generalizations and specifications. The media outlets described in detail all the things the Democrats accused Russia of, yet generalized Russia’s actual role in the conflict in order to avoid explicit statements on this sensitive topic. In other words, the negative actions of the Clinton camp were highlighted through specifications, while the Russia’s negative role was played down by generalizations. Starting with Siegfried Jäger’s CDA approach, this study identified several tactics that were used by the three examined Russian media outlets to depict Hillary Clinton and Donald Trump during their election campaigns. Among them were strategies such as application of visual signs, ideologically loaded word choice and lexicalization, rhetorical figures, hyperboles, implicitness, evidentiality, spreading of misinformation, victimization, polarizations, disclaimers, and comparisons. Furthermore, this research showed that two of the three media outlets favored Clinton as the next American President with regard to the future Russian-U.S. relations. According to the discourses of, although both Sputnik International and The Moscow Times deemed either candidate not beneficial for a harmonious Moscow-Washington relationship, Hillary Clinton was seen be the better President due to her stability and predictability in terms of her predominantly negative attitude toward Russia. However, Russia Beyond the Headlines progressively emphasized Clinton’s negative attitude toward Russia and prominently endorsed Trump as a favorable candidate on the basis of his sympathy for Russia and Vladimir Putin. In general, both Presidential candidates were widely criticized within the discourse of the analyzed editorial pieces, although especially the state-owned Russian media outlets Sputnik and RBTH made several favorable comments toward Trump while often ridiculing Clinton. The main reasons for this increasingly negative coverage of Clinton were her accusations of Russia for being involved in the WikiLeaks email scandal and for Moscow’s alleged interference in the U.S. election. In addition, this research found some attempts to undermine public faith in the U.S. democratic process through victimization and allegedly unfair coverage of Trump from traditional U.S. media outlets as well as Clinton’s and the Democrats’ “dishonest methods” in the WikiLeaks email dump. On the basis of van Leeuwen’s framework of social actor representation, the researcher identified the prominent strategy of assimilating Clinton to a “Clinton camp” while individualizing Trump in order to support the notion of victimization. At least in the coverage of Sputnik and RBTH, Trump was depicted as an outsider, victimized by a corrupt political establishment and defective democratic process that aimed to prevent his presidency due to his sympathy for Russia. According to the analyzed media outlets, Trump’s sympathy for Russia was misused by the Clinton team in order to attack him and Russia at the same time. Finally, this study also showed that all three examined media outlets took a defensive pro-Russia position. The media discourse constructed an enemy image of America, in which it serves as a scapegoat for Russia’s negative actions and the country’s negative development since the collapse of the Soviet Union. America is also held responsible for the negative Cold War image of the current Russian-U.S. relations. Consequently, this enemy image of America, in combination with Clinton’s accusations and her apparent misuse of Trump in order to attack Russia and vice versa, might arguably have led to this defensive pro-Russia position and a solidarity with Trump, which was expressed in the less-than-critical coverage in the analyzed editorial pieces. Ashipu, Kiyiungwumaye Basil Chrisanthus (2013). A rhetorical analysis of selected editorials of Newswatch and Tell Magazines. Studies in Literature and Language, 6(1), 48-53.Bhatia, Vijay Kumar (1993). Analyzing genre: Language use in professional settings. London: Longman. Bovt, Georgy (July 28, 2016). U.S. elections: How Trump became “Putin’s agent.” In Russia Beyond the Headlines. Retrieved from: https://www.rbth.com/elections_in_usa/2016/07/28/us-elections-how-trump-became-putins-agent_615955. Fairclough, Norman (1989). Language and power. London: Longman. Farrokhi, Farahman, & Nazemi, Sanaz (2015). The rhetoric of newspaper editorials. International Journal on Studies in English Language and Literature, 3(2), 155-161. Fowler, Roger (1991). Language in the news: Discourse and ideology in the press. London: Routledge. Intelligence Community Assessment (2017, January 6). Assessing Russian activities and intentions in recent US elections. Retrieved from: https://www.scribd.com/document/335886606/US-Intelligence-report-on-Russia-s-role-in-DNC-hacks?irgwc=1&content=10079&campaign=Skimbit Prozent2C Prozent20Ltd.&ad_group=44681X1528610X6a6a608d1847094fa524285623916168&keyword=ft750noi&source=impactradius&medium=affiliate#from_embed. Jäger, Siegfried (2015). Kritische Diskursanalyse: Eine Einführung. Munich: Unrast. Lipmann, Maria (November 01, 2016). Why the victory of “sane” candidate Clinton is nothing to look forward to. In The Moscow Times. Retrieved from: https://themoscowtimes.com/articles/why-the-victory-of-the-sane-candidate-in-the-us-elections-is-nothing-to-look-forward-to-55966. Lukyanov, Fyodor (September 12, 2016). The Russian card: How Clinton is using Moscow to attack Trump. Retrieved from: https://www.rbth.com/opinion/2016/09/12/the-russian-card-how-clinton-is-using-moscow-to-attack-trump_629203. Ogunsiji, Michael (2001). Introduction to print journalism. Lagos: Nelson Publishers. Reah, Danuta (2002). The language of newspapers. London, England: Routledge. Sputnik4 (October 27, 2016). Russian economy unlikely to experience more pressure after US election. Sputnik International. Retrieved from: https://sputniknews.com/analysis/201610271046794087-pressure-economy-russia-elections/. Sputnik5 (October 17, 2016). Trump’s doubt of US intel’s groundless claims of Russian hack ‘defines logic.’ Sputnik International. Retrieved from: https://sputniknews.com/analysis/201610171046396467-trump-doubt-intel-defies-logic/. ‘Russian agent.’ Sputnik International. Retrieved from: https://sputniknews.com/politics/201608101044134631-clinton-trump-election-smear-campaign/. Trudilyubov, Maxim (July 28, 2016). U.S. Politics caught in a “Russian Trap.” The Moscow Times. Retrieved from: https://themoscowtimes.com/articles/american-politics-caught-in-a-russian-trap-54759. Van Dijk, Teun Adrianus (1988). News analysis. Hillsdale: Lawrence Erlbaum Associates. Van Dijk, Teun Adrianus (1995). Discourse analysis as ideology analysis. In C. Schäffner, & A. Wenden (Eds. ), Language and peace (pp. 17-33). Aldershot: Dartmouth Publishing. Van Dijk, Teun Adrianus (1998a). Opinions and ideologies in the press. Paper round table on media discourse. In Allan Bell, & Peter Garrett (Eds. ), Approaches to media discourse (pp. 21-63). Oxford: Blackwell. Van Dijk, Teun Adrianus (1998b). Critical Discourse Analysis. In Deborah Tannen, Deborath Schiffrin, & Heidi E. Hamilton (Eds. ), Handbook of discourse analysis (pp. 352-371). Hoboken: Wiley-Blackwell. Van Dijk, Teun Adrianus (2004). Ideology and discourse analysis. Ideology Symposium Oxford, September 2004. Retrieved from: http://www.discursos.org/unpublished Prozent20articles/Ideology Prozent20and Prozent20discourse Prozent20analysis.htm. Van Dijk, Teun Adrianus (2006a). Politics, ideology and discourse. In Ruth Wodak (Ed. ), Encyclopedia of language and linguistics; Second language and politics (pp. 728-740). Barcelona: Universitat Pompeu Fabra. Van Dijk, Teun Adrianus (2006b). Ideology and discourse analysis. Journal of Political Ideologies, 11(2), 115-140. Van Leeuwen, Theo (1993). Genre and field in critical discourse analysis: A synopsis. Discourse & Society, 4 (2), 193-223. Van Leeuwen, Theo (2008). Discourse and practice: New tools for Critical Discourse Analysis. Oxford: Oxford Studies. Wodak, Ruth, & Meyer, Michael (2009). Critical discourse studies: A sociocognitive approach. In Ruth Wodak & Michael Meyer (Eds. ), Methods of critical discourse analysis (pp. 62-86). London/Thousand Oaks: Sage.